Darshi! Thieves, saints, scoundrels and sages think that the others are like them. The God created by human mind is momentary as a cloud sky clearing. The one who regards him as an inspirer or patron of evil ideas, isn’t certainly experienced in human knowledge. Thus he destroys new good ideas and doesn’t understand how important mankind is. He behaves like a fierce, dishonest and inconstant double-faced wolf. Darshi, he won’t ever be able to obtain human qualities indeed. Religious person’s thoughts won’t ever be able to have these uncertain views. He doesn’t shed men’s blood as wolf does when it have a chance to do that. Darshi! An unpleasant and diabolical person is double-faced and inhuman and criminal. No action praises him now and history won’t forgive him. Darshi, the present and the future praise only noble people. These men are sadhus. Darshi! A homeless sadhu is a universal king, an emperor, he will get the glory. Darshi! The day I met Chethariya Vir Baba was an unprecedented experience and a great honour, it was a very glorious day. I was honoured to meet Chethariya Vir Baba, that great soul (mahatma). His face had a pale red complexion, his nose was long, his hair thick, his beard white like foam and his forehead was very prominent. I found him happy, modest and satisfied because he had achieved happiness. He looked at me as fire hidden in ash. I saw that great man, the destroyer of sins, in Malati forest, on the western part of the mountains, in the village of Shakradhar (Sogra). 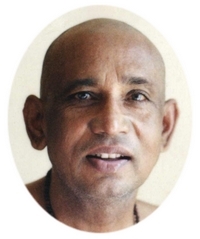 Darshi, this great man’s inner depth and the treasure of his virtues have blessed me. Darshi! From then on the rays of light you are seeing are always behind me. They are the very Chethariya Vir Baba. This entity has no form, it is a formless body. Touch it! You will feel its coolness as if you were touching God in his psychic form. Stretch your hand out, look inside, have you touched it? Can you feel how joyful it is? This isn’t the body, it is just the heat of light. He enters everyone. When this happens, the pratictioner (sadhak) get the glory of complete Enlightenment. The fortuitous spiritual manifestation of these great men through their formless psychic body produces boundless inspirations. Darshi! It is for this reason that purity of action and word must go together with purity of soul. The person who develops all these qualities is protected by the shadow of these great men and he creates also a favourable atmosphere which attracts and inspires the contact with kind people. After obtaining Chethariya Vir Baba’s protection through his emanation of divine light, my mind was satisfied and fulfilled and I had almost no unsatisfied wishes in my heart. He is also Kapaleshwar. Now he is at the edges of every city and village and worshipped under many names and forms. In some places he is called Bahoran Das, in other places Dihawal Baba, God of the village, God of the forest, etc. In the tribal area is adored as Sharana. Thus Chethariya Vir Baba, assuming all these different names and forms, preserves villages and cities from the evil spirit, saving them from the hateful disease. In the villages where Chethariya Vir Baba isn’t worshipped, epidemics such as smallpox, cholera, leprosy, quarrels, malice, dishonour and asociality happen. Oh Darshi! You have seen that, if in some village or city there is cholera, crimes happen. As soon as you enter those places, in that very moment, you start feeling that nature is becoming terrifying, there is a mortal expression on people’s face, gaze is lost, dishonour rules everyone. Darshi! I am always passing through many villages and cities, but, entering a city or a village, immediately I realize that there the God of the village, the God of the city, Chethariya Vir Baba, has been ignored. Darshi! While you go through villages and cities, I see and I know such things. Even this is one of the main reasons of my detachment. My heart is disinterested and indifferent when it hears and knows the deplorable and adverse condition of people living this way. Darshi! If you meet people behaving this way, don’t lose your mental balance. Don’t talk to them in an angry tone. They are victims of impatience and have a lot of faults. Darshi, try to have Chethariya Vir Baba’s shadow behind you. He will inspire you, He will inspire you with confidence. Darshi, go now, it’s time for you to finish your work; as the time has come, I’m going too to do those things I have to do.